Ever since I first saw the dreamy, sixties-esque imagery for Miu Miu's original perfume, complete with a girl, winged liner and a cat, I was smitten. It was truly a case of judging a fragrance by its campaign, something I am sure I am not the only one guilty of doing. After many spritz sessions in department stores, I finally nabbed the rollerball in Melbourne and last month was lucky enough to be sent both the fragrances, in celebration of L'eau Bleue. Spoiler alert: they are both lovely. Is it difficult to choose one? Quite simply, yes. Miu Miu*: The original, or OG as the kids seem to say now. The opaque, quilted turquoise bottle reminds me of something you might see in furniture from days gone by and in more recent times, the statement earrings that are appearing on many an earlobe. Its key notes are Lily of the Valley, Akigalawood and Sandalwood. Side note: Akigalawood is a note derived from Patchouli Oil and is what gives scent a slightly woody, floral undertone. If you want a fragrance that leaves a lovely impression, and is the perfect blend of woods and floral, this is for you. It is impressionable, intoxicating and alluring. 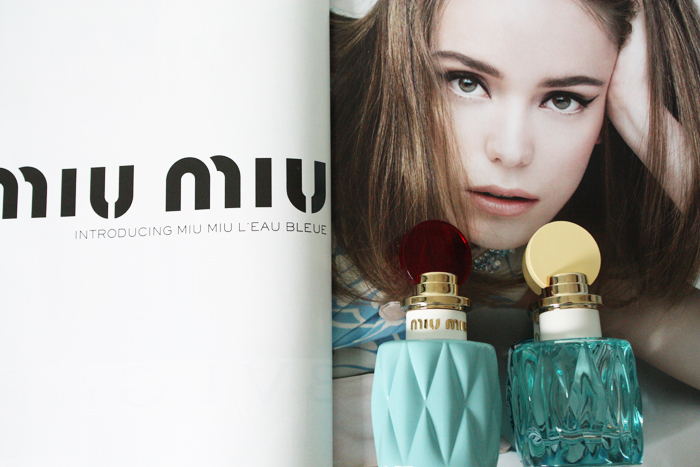 Miu Miu L'eau Bleue*: Miu Miu's latest fragrance offering launches on the 3rd of April here in New Zealand and while similar to its original incarnation, it certainly stands out on its own. For those who find the original too intense, you may prefer this slightly lighter offering. It has notes of Lily of the Valley, Wild Rose and Akigalawood. It is light and fresh, without being overly floral and is equally as exquisite. If we were to describe the fragrances, this would be your daytime option and the original, the nightlife alternative. Miu Miu parfums are available in New Zealand at Smith and Caughey's, David Jones Wellington and Ballantynes Christchurch. -Have you tried the Miu Miu parfums? What do you think of them?